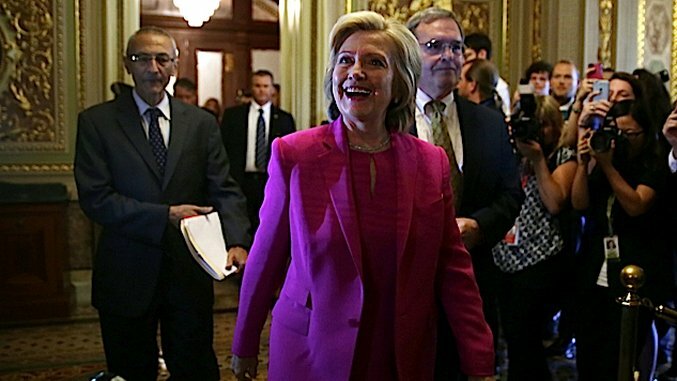 Hillary Clinton’s campaign has often been accused of illegal coordination with super PACs, and in fact hacked emails have all but proved the connection. Even though Correct The Record, a pro-Clinton super PAC owned by David Brock, has publicly acknowledged that it participates in this kind of activity, the campaign has always denied the allegations. But newly released emails by Wikileaks, reveal a different story. The whistleblower group has been a thorn in Clinton’s side for several months now, and its latest release is damning. On May 2, 2016, The New York Times published an article titled “F.E.C. Can’t Curb 2016 Election Abuse, Commission Chief Says” explaining how the Federal Election Commission was paralyzed by partisan difference among its six commissioners. The report also detailed how campaigns were increasingly willing to violate federal election law prohibiting campaign coordination with super PACs. 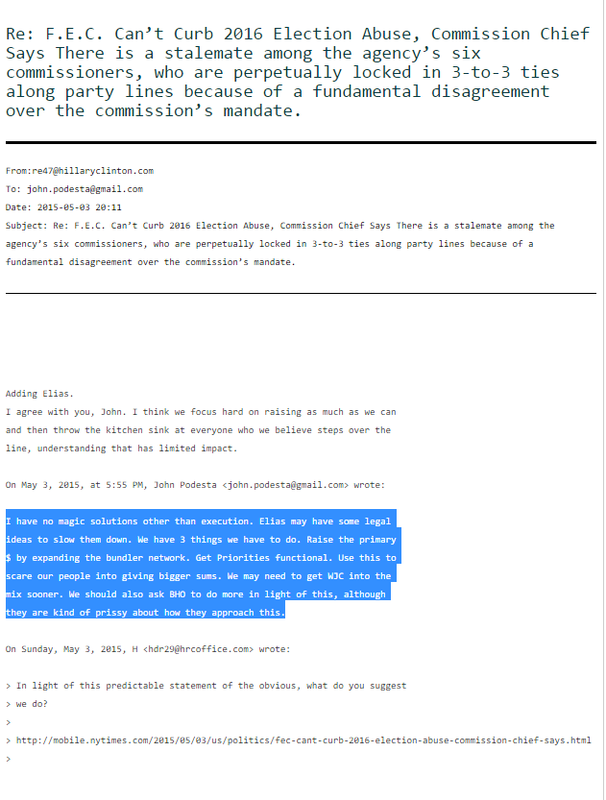 An illuminating email exchange from May 3, between Clinton, her campaign chair John Podesta, and campaign manager Robby Mook shows that the three privately discussed about the Times article in relation to their coordination with super PACs, and decided how to proceed. “In light of this predictable statement of the obvious, what do you suggest we do?” Clinton writes. I have no magic solutions other than execution. Elias may have some legal ideas to slow them down. We have 3 things we have to do. Raise the primary $ by expanding the bundler network. Get Priorities functional. Use this to scare our people into giving bigger sums. We may need to get WJC into the mix sooner. We should also ask BHO to do more in light of this, although they are kind of prissy about how they approach this. Priorities, we should note, is Priorities USA Action, the largest Democratic Party super PAC, and though it obviously supports Clinton’s presidential bid, it is clearly against the rules for her campaign to coordinate with them directly. Nevertheless, that’s exactly what Podesta is outlining. And if you were waiting for Clinton or the other staffers on this distribution to be shocked, you will be waiting a long, lonely time. Adding [Marc] Elias. I agree with you, John. I think we focus hard on raising as much as we can and then throw the kitchen sink at everyone who we believe steps over the line, understanding that has limited impact. 4. Per John’s question below — there is one legal tool we could use that might slow them down. The law has a little noticed or used provision that says that if a complaint has been filed and it is either dismissed or not acted upon within 120 days the entity that filed the complaint can sue the FEC to force it to proceed with enforcement. If the FEC fails to move forward, then the complainant is permitted to bring their own lawsuit to enforce the law directly. IF it were announced that this was the path we intended to take, it would both make news and perhaps give pause to the groups. Is this something we want to push forward? If so, would we want the DNC to do it? The campaign? Or would we prefer it be done externally? It would be hailed by the reform groups, but is a significant step in legal escalation and will certainly result in similar action against Priorities et al. This exchange, in which the campaign is essentially discussing the best way to “slow” Republicans coordinating with super PACs, without themselves getting burned for the same kind of activity, reveals two key points. 1. Top Staff from Clinton campaign—likely including Clinton herself—knows of coordination with super PACs. We’ve already known for several weeks that Podesta was aware of the campaign’s illegal coordination. The Intercept reported on several emails released earlier this month that demonstrate as much beyond a reasonable doubt. Now, however, we see the campaign chair discussing it openly in an email exchange with Clinton herself, along with Mook, Elias, and Palmieri. Podesta’s suggestion to make Priorities USA Action “functional” while using legal tools to “slow” the GOP down, along with Elias’ words of warning to take care the campaign does not hurt itself in the process because of that super PAC’s activities, is as much a smoking gun as has been found in a Wikileaks release to date. That raises the next point. 2. Marc Elias should have advised his clients differently. Elias may have committed an ethics violation in his email response. Nowhere did he make any suggestion that the campaign not engage in the illegal coordination. Rather, he cautioned Podesta to be careful what path he chose because of the activities of Priorities and other pro-Clinton super PACs the campaign was obviously coordinating with. There is a question as to whether or not this kind of legal advice constitutes an ethics violation. Lawyers are generally prohibited from knowingly counseling or assisting their clients in committing a continued crime or fraud. The American Bar Association’s Model Rule 1.16(a)(1), comment , paragraph (d), says as much. The activities the campaign is engaging in likely constitute a criminal offense. In June of 2015, in a landmark case, a nationally prominent Republican operative, Tyler Harber, was sentenced to two years in prison for illegal coordination with super PACs by a district judge in Virginia. We now know that Clinton and many of her top level staff are indeed aware of that the campaign is engaged in illegal activity. 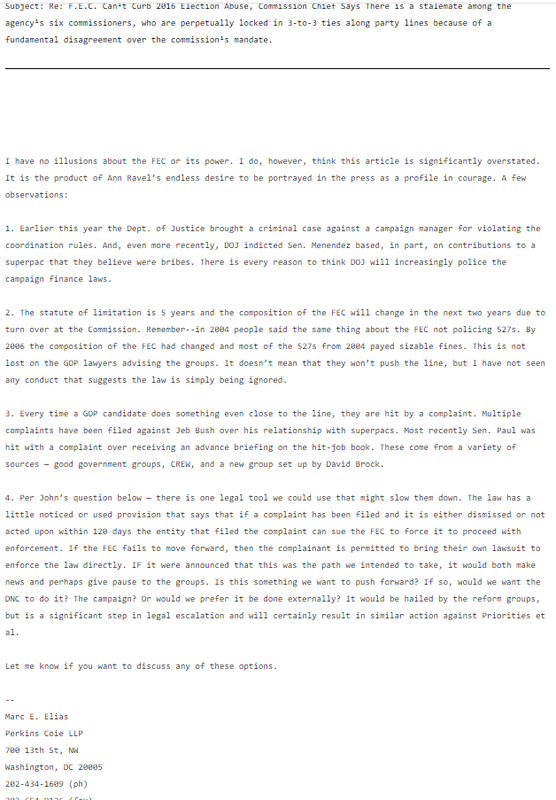 This revelation will probably amount to very little for reasons detailed in the Times piece that started this email chain: The FEC is unable to enforce the law due to partisan differences between its six commissioners. By design, the agency is not allowed more than three commissioners from the same party, and it requires a majority to move forward with enforcement. Lately, the three Republican commissioners are unwilling to lend their support for any such measures—especially after the Citizens United v. FEC Supreme Court decision. And then, of course, even if it were to act, Clinton’s campaign is by no means alone in its flouting of the law. The practice is widespread. As The Intercept reported, Trump’s campaign is also guilty of this offense.